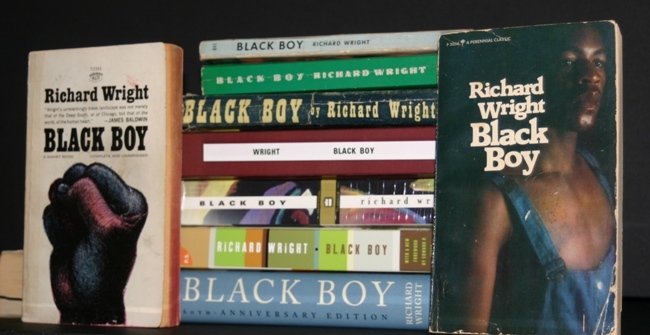 I first began thinking about Black Book History in a deliberate way in 1999, my first year of graduate school as I began working on a project concerning editions of Richard Wright's autobiography. I happened upon a couple of first editions of his works at a used bookstore, and realized that the covers for his autobiography Black Boy were quite different. I began locating additional editions and taking note of the changes. Although Wright wrote about his southern and northern experiences in his autobiography, only the southern section was published as Black Boy in 1945. The autobiography was a Book-of-the-Club selection and received widespread attention. The book followed Wright's Native (1940), which had earned him international acclaim. Over the years, publishers produced different printings and editions of Wright's book. In 1977, they released his writings about his northern experiences as a book, American Hunger. In 1991, for the first time, the southern and northern experiences were published together as Black Boy (American Hunger). Click here to see multiple looks: Richard Wright Autobiography covers. Wright's Black Boy is one of our more well-known autobiographies, and the extended and fascinating publishing routes make the work noteworthy in the context of Black Book History.